Ever wonder where were your T-shirts or pants made? 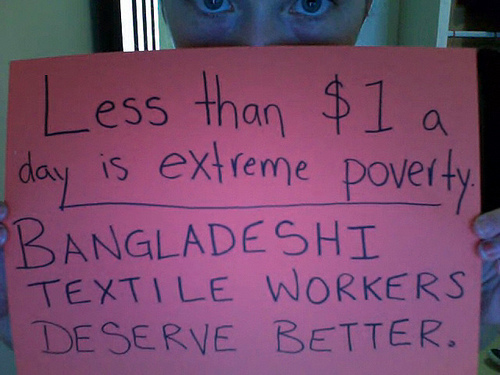 If you are living in North America or in Western Europe, there is a high chance that you are wearing a cloth made in Bangladesh. And no wonder Bangladesh’s export earnings are mostly determined by the export of ready-made garments (RMG) which is about 75% of the total export earning of the country. But in recent times the textile sector has seen some confrontation between the workers and their employers over wages related issues. Bangladesh's competitive advantage had been skilled workers and low wages but due to inflation the old minimum wages has become an absurd figure now. The garments factory owners associations have long been able to halt the talks of raising of minimum wages claiming that if wages are raised they will not be able to maintain competitiveness and lose market especially during the global recession. Their bargaining point was that because most of the workers do overtime they actually earn one and half to twice the amount of the minimum wages. But this has also increased the unhealthy practice of exploiting more labor hours from the workers. The last pay scale was fixed in 2006. The wages board recommended an wage of Tk. 2300 per month (US$ 33) but after the hard bargaining from the employers Tk. 1662 per month (US$23) was fixed as the minimum wage. Due the inflation of currency and prices it has become difficult for the workers to live with this pay even in the slums of the towns. After three long years no change was made to the minimum wages scale. The wages of one day of any garments worker starts from Tk. 55. They will have to use this meager amount to pay their rents, meal, personal hygiene etc. [..] All these ladies will have to give birth to children without proper reproductive hygiene, these children will be the future generation – please beware. The main reason for these unrest are underpaying the workers, defaulting on labor payments, shutting down the factory without paying their dues and not paying bonus during Eid festival. But a few garments factory owners are trying to fool people by blaming these incidents as politically motivated. After long bargaining with the employers and the workers, the Government has finally decided to raise the minimum wages to Tk. 3000 per month ($44) which is approximately double of the current minimum wages. The wages structure will be formally announced tomorrow. * নতুন বেতন যদি নূন্যতম বেতন ৩০০০ টাকা করা হয়, তাহলে এই সেক্টরে কী সমস্যা দেখা দিতে পারে ? গার্মেন্ট শিল্প কি বন্ধ হয়ে যাবে ? * নতুন বেতন বৃদ্ধিতে গার্মেন্টের লাভ কমে যাবে বলে অনেকেই ধারণা করছেন। গার্মেন্ট শিল্পগুলো কিভাবে চলবে তখন ? * If the minimum wages is increased to Tk. 3000, what problems will this sector face? Will many factories be closed? : No I don't see the chance of incurring huge loss. Because every factory in the sector will have to increase wages, so the competitive prices will be at the same level. The buyers don't really have many options, so they will have to accept the increase in price. You have to keep in mind that the cloths we manufacture are very basic in nature and of low cost, so worldwide they will continue to have demand. * People say that the profit of the garments companies will decrease causing them to shut down. How will they survive with the increased costs? : I think the increase in wages will come as a blessing. The factories will have to embrace new technologies and deploy scientific production methods. this will be beneficial for the industry. The sectors like production engineering will be revitalized, skilled workers and mid level management will require more training.